A few weeks ago, I received a message from my friends Bradley Davis and Bruno Rennó, who are also birding guides, asking me if I would be interested in joining them for a Big Day. The big day is a tradition among birdwatchers, which is when we try to register the biggest number of species within the 24 hours of one single day. The date set was May 13th, chosen to be the Global Big Day by eBird, a program supported by the Cornell Lab of Ornithology and the National Audubon Society, both from the USA. Around the world, thousands of birdwatchers and ornithologists submit their observations to the eBird platform, which turns into important data for research and conservation. If done regularly, Big Day counts can provide key information about the abundance of each species over the years. Our goal was to register the biggest number of species for a big day in Brazil and break the Brazilian record, set in 2016 in the endemic-rich Atlantic Rainforest of São Paulo state: 256 species. We also wanted to raise awareness for conservation and help collect donations for a local NGO that makes an important work for conservation in Brazil: Save Brasil, a direct partner of Birdlife International. We knew of a few other groups that had the same goal as we did, but one team stood as a serious contender: Ciro Albano, a good friend and great birder from Northeast Brazil that also had a bold strategy in Bahia state. It was meant to be a fun competition! Our strategy was to bird two different ecosystems in the same day, the highly diverse Amazon rainforest and the rich and abundant Pantanal wetlands, all within Mato Grosso state. We started in Jardim da Amazonia, a lovely lodge in the southern edge of the Amazon Basin. At 2:00 am Team Amigos da Save was already out looking for nocturnal birds! We rushed through the forest trails searching for those birds that had being seen there before. When the mixed-species flock finally came across our path, we watched and waited until we saw all the birds expected to be in that group. We were missing one until Brad yelled: “there it is, Yellow-bellied Dacnis. Move on.” And we kept birding until 10:30 am, when we had registered 182 species already! We got in our vehicle and started our long drive South through what once was forest and savannas, but has being now transformed in to soy beans, sugar cane and cotton plantations, which are responsible for most of the GDP of the state. On the way we heard news about the team in Bahia: they were already over 200 species! We collected a few more species along the way, but by the time we arrived in the Pantanal, at 14:40, the other contenders had already broken the Brazilian record! Our dream started to faint, but our first stop in the Pantanal was quite amazing, and we added a good number of species in just a few minutes! The adrenaline rushed again. We entered Pousada Piuval, a well-known spot among birders, which I know very well and had being birding there just a week before. We went after the birds we expected, and although some species didn’t show up (it was in the hot afternoon already, when bird activity decreases) we kept registering a lot of species and soon reached our goal of 260 species! But Ciro’s team was above that, and we still had quite a few hours ahead of us. The last hours of the day were filled with frenetic birding, and by the time the sun came down we had reached the 300 species mark! A quick celebration with a can of energy drink and it was time to look for nocturnal birds again. We were very tired already, but there were still a few birds to see. Despite the hungry mosquitoes that appeared out of nowhere, we saw the nightjars that we expected, but the Ciccaba owls disappointed us: we heard one in the distance, but couldn’t decide if it was the Mottled or the Black Banded owl, so neither made it to our list. But we still found four species of owls that night! When we decided to call it the day, we had registered 307 species. We were exhausted, but happy and proud. We had accomplished something that we couldn’t even dream of in the beginning of that day. 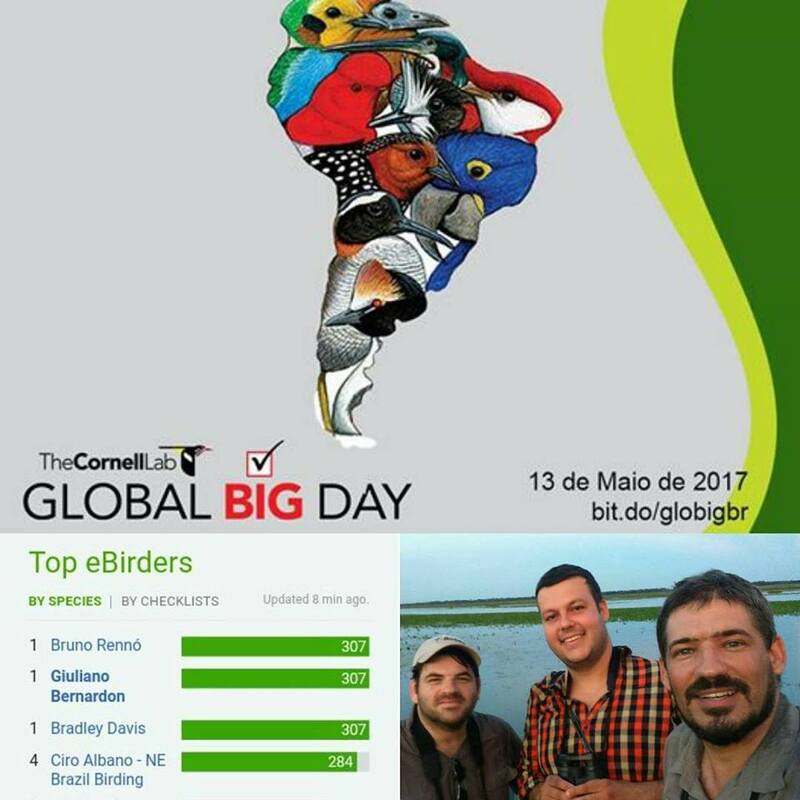 When we uploaded our data to eBird, we found that our list wasn’t only the biggest in Brazil, but the biggest in the entire world for this Big Day! Wow! In the end, our Big Day wasn’t just about the competition, or registering the biggest number of species. Birdwatching is about the love of nature, of the birds, and the friendship and camaraderie that bond the people that love birds. It is about sharing good moments in life with other people, or sometimes just with yourself. 10 cans of energy drink! Well, hope you enjoyed reading about this, leave your comments bellow! And if you ever plan to come to Brazil, we will be glad to share such moments with you! Our company is based in Cuiabá, the Geodesic center of South America and a strategic gateway to the Pantanal, Cerrado savannas and the Amazon.